The Last Enemy – Living in the UK - Nothing to Hide? To my shame, I missed this when recently screened on BBC, but a friend alerted me to this timely TV mini-series about surveillance culture, who having listened to tireless ramblings in the past on my foresight on ID card technologies, was suddenly realising ‘tomorrow really is nearer then he thought’. After four years abroad, Stephen Ezard returns to London for his brother Michael’s funeral. National security fears have transformed Britain into a security state and U.K. citizens have their movements tracked by the government. Stephen finds himself in the midst of a conspiracy as he sets out to discover what really happened to his brother. A timely and balanced pseudo-fictional piece set in the not too distant future in the UK. All citizens must now carry ID cards, and the government is successful in getting at least half the population to adopt them. Not being able to enter certain buildings or buy/sell certain items certainly puts the pressure for further adoption by the masses. RFID (Radio Frequency Identification), the latest barcode technology tracking items from ‘field to fork’ has evolved into some kind of satellite surveillance tracking system and sits alongside a proposed super database called T.I.A (Total Information Awareness) which is trying to be marketed to the public as a way of further safe-guarding their own security. Conspiracy theories, Whitehall corruption, illegal immigrants, ID fraud and anti-ID movements all abound. As you would expect, the series tries very hard to not tread on toes of predecessors such as ‘1984’ but did remind me of ‘Fahrenheit 451’ with its armed police patrols and inevitable iris scans of ‘Minority Report’, albeit with a lot more wooden acting and succinct jumps that were more like what one would see in ‘24’ then real human interaction. Phone someone, say your piece, hang-up –without so much as a hi or bye seemed to be a deliberate way to keep the programme succinct and fast-paced but to me felt it treated the audience in a condescending way. Acting styles aside, what really was of interest to me was the handling of the technological realism and proposed advancements. I found a serious flaw. The blur between science fiction and science fact here was based upon a lack of understanding of what really is in place now and how this will evolve. There was confusion between people needing to be maliciously tagged and bugged in order to monitor and/or control them and the T.I.A database, joining all the dots of separate informational monitoring in order to gain access to peoples routines and habits. RFID tags will be on everything by default and are already permeating society at alarming speed. Go to Tesco’s or Superdrug these days and see the little square-stickers on the side of the packaging – do they get switched off when leaving the store? 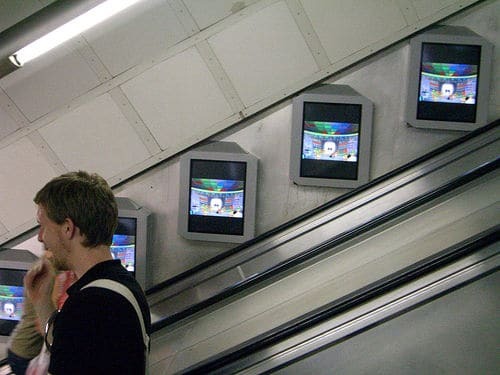 Oystercard’s – 10 million Londoners carry these RFID-enabled surveillance chips on their person and use them to enter the transport system every day – a back-door ID card that has been marketed en-masse and gone under the radar of most people as to its surveillance significance. 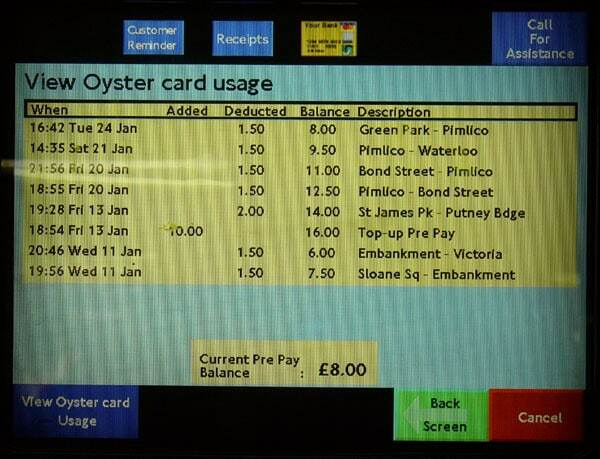 Barclaycard and MasterCard’s ‘wave-and-pay’ schemes linking purchases to products to position all by RFID – especially true when combined with an Oystercard. Triangulation of mobile phones with or without GPS monitoring (iPhones don’t use GPS for mapping) already enable positions to be broadcast – over a third of the globe carry a unique number mobile phone and hardly ever turn it off. That’s well over double those who use the Internet! 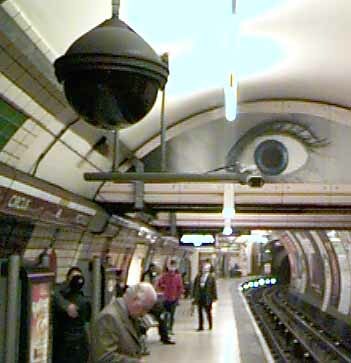 CCTV cameras record the average Londoner 300 times per day, and since 2003 – starting in Soho and now spread as wide as Maidavale – carry microphones and record what is being said. They are also wireless and remote-controlled. Not to mention the roaming cameras mounted on anything from police vans to Smart cars. Go for a run with Nike Air whilst listening to your iPod and you aren’t the only one who is tracking your heart-beat and position. The Technology in the trainers can be picked up 60 feet away or by a passing car. 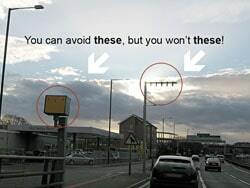 Drive down the A4 and see those new camera rigs overhead. DVLA’s new e-plate system that will pick up your RFID number plate from 300 yards and will cross reference vehicle licensing, insurance, and speed monitoring in the blink of an eye. 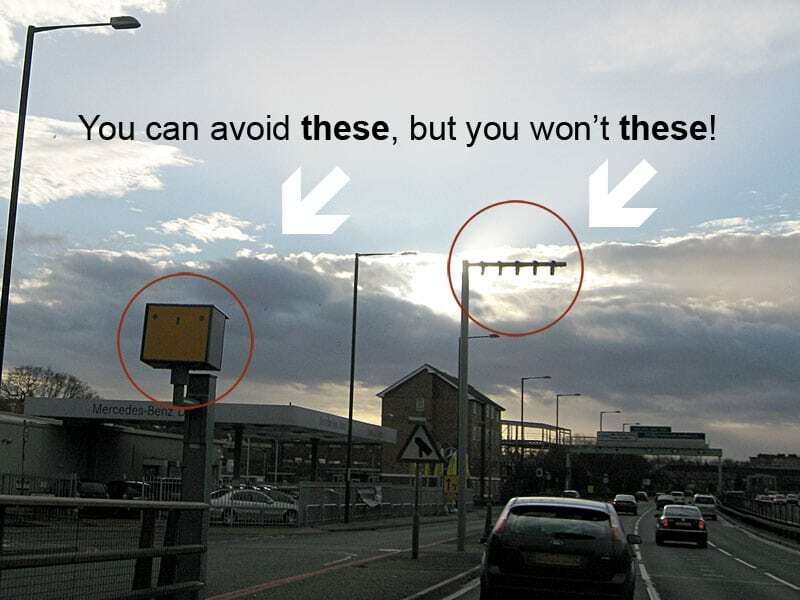 Think you can speed up and slow down to avoid the cameras – insurance companies offering cheaper insurance for tagged cars and your inclusion of satellite navigation systems got rid of that a long time ago… See how many cameras are down the M6 toll-roads – why bother when the RFID-enabled average speed check is already in place. Oh and plenty of clubbers have already decided to allow themselves to be RFID chipped to enter VIP areas. How cool to walk into a bar and the bouncer giving a knowing nod as you walk straight in without having to show ID. Appeal to your ego in front of your friends and girl you are trying to impress? Yes, you are known. Or maybe I am somewhere in Tesco’s seeing if anyone is in your vicinity – watching where your child is in relation to you – they have just moved out of eyesight around the other aisle… betrayed by their ‘sneakers’. How strange, look the advert on the e-billboard you are standing next to just changed to an offer from Coke, you must get some – of course you may have forgotten you had none left, but I know what you put in your bin, remember? 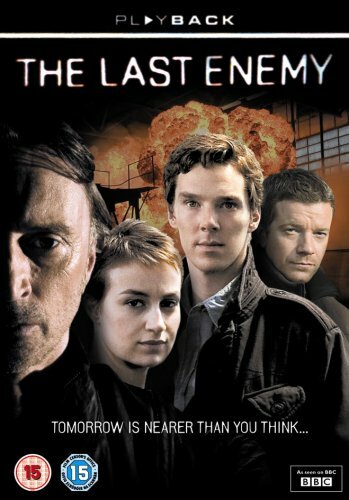 Watch the Last Enemy but realise the only thing futuristic about it is the armed police on the UK streets. Buy the DVD here and read what others have said here and here. See the category on the top for more of my comments on RFID. GPS is the way to future. I see in next 20 years or so , may be no vehicle in our countries will be without gps. However , cost is still a problem , specially in developing nations. But I am sure , with increase in demand the cost will come down. Nice blog. Thanks for letting me know about your blog. You do raise some interesting points.